Saorview Ireland - Get Connected before the 24th of October. Free Irish Digital Terrestrial TV (Saorview) provided by RTE and installed by your local TV Services engineer. Launched in May 2011, Saorview is the new Irish digital TV service. Enjoy crystal clear pictures and some great Radio Stations and all for free. What Channels do I get on Saorview Why TV Services? 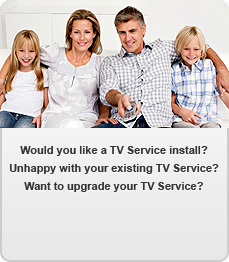 All TV Services Saorview Installers Have A Minimum of 5 Years Experience. Local Saorview Installers, With In-depth Knowledge of Your Area. Quality Materials & Tools To Ensure The BEST Saorview Installations. SAORVIEW is Ireland’s first free digital television service. It brings you all your favourite Irish channels, crystal-clear pictures, better quality sound, on-screen programme menus and digital teletext - all for free. It’s easy to make the switch. Analogue Switch Off (ASO) is when analogue television transmission in Ireland will be turned off. This will happen in late 2012. Like the rest of Europe, North America and many other countries, television broadcasting in Ireland is switching from analogue to digital transmission. The EU has mandated the end of 2012 as the final date for ASO in Europe, by which time Ireland needs to have launched a replacement digital transmission system to ensure all Irish audiences can continue to access free-to-air television. SAORVIEW is the digital free-to-air television service that will replace the analogue system which has been in operation since 1962. The switch from analogue to digital is both national and EU policy. The Government department with lead responsibility is the Department of Communications, Energy and Natural Resources (DCENR). In August 2010, Minister for Communications, Energy and Natural Resources established a Digital Switch Over Steering Group, with additional working groups, to manage the switch from analogue to digital television. How do I receive Saorview? If you have an old TV set which is not HD, then we recommend that you purchase a new TV so you can enjoy the full value of the Saorview service.